for all students 5th grade thru 12th! Check our facebook for more details. April 13th, 11am at Russo Park – 5th Graders & below! Registration is closed! If you’ve already registered there will be a check in table at the event! You Can Belong in Christ’s Family. Recognize how much God loves you. Admit that you’re a sinner—that you think, say and do things that displease God. Realize that the penalty for sin is eternal separation from God. Understand that Jesus died in your place to pay the penalty for your sin. Place your trust in the resurrected Lord Jesus Christ to be saved. Speak with God in Prayer. Crossroads Community Church of Philadelphia helps people belong, grow and serve in Christ’s family as we share the gospel and glorify God. We want to help people find new life through faith in Jesus Christ, enjoying fellowship with a congregation of like-minded friends. We want to help believers grow toward Christ-like maturity, acquiring character, knowledge and skill that honors God. We want to help growing Christians discover and employ spiritual gifts, talents and abilities that build up others and glorifying God. We want to share the good news that sinners who repent and place their trust in Jesus Christ are forgiven, empowered by the Holy Spirit and granted the blessing of Heaven. We want to help people honor God by developing a lifestyle of personal and congregational worship. With the Lord’s help, we plan to initiate and develop congregations that practice deeds of righteousness and proclaim the gospel message. We want to serve our neighborhoods in ways that affirm God’s love, mercy and grace. And we want to explain the good news about salvation so our neighbors can experience God’s goodness through faith in Jesus Christ. As the Lord enables, we plan to grow congregations in urban neighborhoods where believing residents develop and deliver Biblically relevant ministries that meet the needs of their families, friends and neighbors. As God allows, we expect to grow new congregations in neighboring communities throughout the city as we advance the gospel in word and deed. The Bible: The Word of God, the sixty-six Books of the Old and New Testaments, verbally inspired in all parts, and therefore wholly without error as originally given of God (2 Tim. 3:16; 2 Peter 1:21). The One True God: Existing eternally as three persons the Father, the Son, and the Holy Spirit (Luke 3:22; Matthew 28:19; 2 Cor. 13:14). The Lord Jesus Christ: His preexistence and deity (John 1:13), incarnation by virgin birth (John 1:14; Matthew 1:18-23), sinless life (Heb. 4:15), substitutionary death (2 Cor. 5:21), bodily resurrection (Luke 24:36-43), ascension into heaven and present ministry (Heb. 4:14-16), and coming again (Acts 1:11). The Holy Spirit: His personality (John 16:7-15), and deity (Acts 5:3-4), and His work in each believer: baptism and indwelling at the moment of regeneration (1 Cor. 12:13; Rom. 8:9), and filling (Eph. 5:18) to empower for Christian life and service (Eph. 3:16; Acts 1:8; Gal. 5:22-23). Man: His direct creation in the image of God (Gen. 1:26-28), his subsequent fall into sin resulting in spiritual death (Gen. 3:1-24; Rom. 5:12), and the necessity of the new birth for his salvation (John 3:3-5). Salvation: A complete and eternal salvation by God’s grace alone received as the gift of God through personal faith in the Lord Jesus Christ and His finished work (Eph. 2:8-9; Titus 3:5-7; 1 Peter 1:18-19). The Church: One true church, the body and the bride of Christ (Eph. 1:22-23; 5:25-32), composed of all true believers of the present age (1 Cor. 12:12-13); and the organization of its members in local churches for worship, for edification of believers, and for worldwide gospel witness, each local church being autonomous but cooperating in fellowship and work (Eph. 4:11-16). Christian Life: A life of righteousness, good works and separation unto God from the evil ways of the world (Rom. 12:1-2), manifested by speaking the truth (James 5:12), maintaining the sanctity of the home (Eph. 5:22-6:4), settling differences between Christians in accordance with the Word of God (1 Cor. 6:1-8), not engaging in carnal strife but showing a Christlike attitude toward all men (Rom. 12:17-21), exhibiting the fruit of the Spirit (Gal. 5:22-23), and maintaining a life of prayer (Eph. 6:18; Phil. 4:6), including the privilege, when sick, of calling for the elders of the church to pray and to anoint with oil in the name of the Lord (James 5:13-18). Ordinances: The Christians should observe the ordinances of our Lord Jesus Christ which are (1)baptism of believers by triune immersion (Matt. 28:19) and (2)the threefold communion service, consisting of the washing of the saints’ feet (John 13:1-17), the Lord’s Supper (1 Cor. 11:20-22, 33-34; Jude 12), and the communion of the bread and the cup (1 Cor. 11:23-26). Satan: His existence and personality as the great adversary of God and His people (Rev. 12:1-10), his judgment (John 12:31), and final doom (Rev. 20:10). Second Coming: The personal, visible, and imminent return of Christ to remove His church from the earth (1 Thess. 4:16-17) before the tribulation (1 Thess. 1:10; Rev. 3:10), and afterward to descend with the Church to establish His millennial kingdom upon the earth (Rev. 19:11-20:6). In 1991, Jim Brown led a church planting team that established Crossroads Community Church in the Frankford section of Philadelphia. 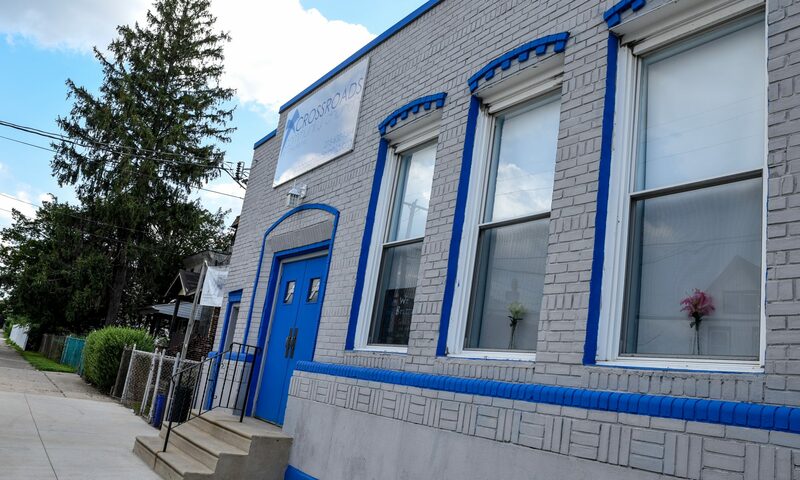 With support from the Charis Fellowship, MetroGrace was established in 1999; Fast forward and there are now four churches in four different neighborhoods in Philadelphia. Check our locations for a church nearest you. Our purpose is to help people belong, grow and serve in Christ’s family as we share the gospel and glorify God.